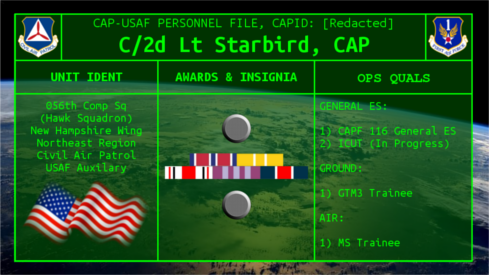 CAP Talk | General Discussion | Membership | Topic: New CAP 60-1: What exactly is a Cadet Staff Officer? New CAP 60-1: What exactly is a Cadet Staff Officer? Edit: That was stupid. I misread the table -- completely. Somehow my eyes neglected to see the words "Support" in there. Sorry for the useless thread. Been looking at the new CAP 60-1 (Cadet Program Management) as part of an SDA. Are all now present. They do no have corresponding positions in the Cadet Staff Handbook. I am mildly confused by this as there is no official duty position description that I could find. Could someone enlighten me? Re: New CAP 60-1: What exactly is a Cadet Staff Officer? No worries. Good question, actually. So when the promotion curriculum is addressing "staff service," they're referring to holding a role as Cadet Staff, whether "line" (operations) or "support" (mission support)---the people who formally would have reported to the C/XO, but under the new Cadet Staff Handbook would report to the Mission Support Officer or Cadet Deputy Commander for Support. Cadet officer staff service would be in this capacity but in an officer-level position (e.g., Flight Commander, Cadet Communications Officer, etc.). *A staff assistant would generally be regarded as someone who serves to help the C/NCO in their staff job. This is usually considered applicable for the support team. An example would be having a Cadet Safety NCO who, say, helps conduct risk management and safety briefings before activities, that has a Cadet Safety Assistant who is a junior cadet who helps with monthly Safety Education. Element Leaders are not generally 'staff' but they are the junior-most leadership position. You wouldn't normally have Element Leaders in a staff meeting. They would be briefed later by their Flight Sergeant, Flight Commander, or First Sergeant (depending on rank...obviously, Element Leaders can be a wide variety of grades). Remember, the Cadet Staff Handbook is guidance for staff positions and their duties. Your unit can modify its cadet structure to meet the needs of the training program at the unit and provide the most effective staffing. You just need to provide cadets with a job description so they know their role and what is expected of them. What CAPR 60-1 does is lay the foundation of what must be done, and then the handbook helps you build a program off of that. The roles in the Cadet Staff Handbook are not all-inclusive. You can make more roles or cut some out as appropriate for your unit structure and needs. I love this topic in TLC. I like to have my team perform this exercise (maybe I'll have my CP officers tonight do it). Build a staff (on paper) based on appropriate ranks, roster numbers, and essential functions that need to be performed.